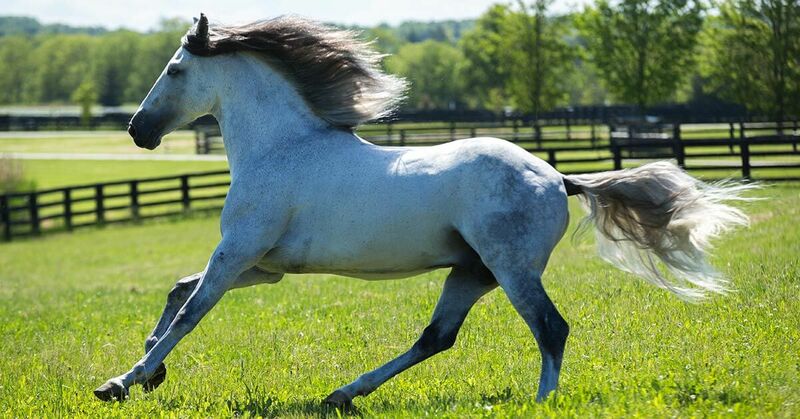 This beautiful Lusitano is trained in three disciplines: Dressage, Liberty and Jumping. One of the younger performers with Cavalia, Tutor is a beautiful 7-year-old stallion. Stallions and geldings differ a great deal in regard to their behaviour and overall demeanour. Because of this, it’s good to have a nice mix of both. There are 65 horses (all males) in the Odysso production, and Tutor is one of 16 stallions. Stallions have – by nature – more spirit and run a bit “hotter” than their gelding counterparts. Believe us when we say, Tutor is a stallion through and through. This beautiful Lusitano is trained in three disciplines: Dressage, Liberty and Jumping… he absolutely loves to show off on-stage. The raw energy needed for Jumping, the balance and control needed for Dressage and the trust required for Liberty training demonstrate to what extent Tutor’s abilities are extremely well-rounded! His high-energy and “hot-to-trot” personality is a great addition to the Cavalia team, even more so as this stud performs in three different acts in Cavalia’s latest production Odysseo: “The Travelers”, “Village Celebration” and the Odysseo Finale. The act, “Village Celebration” is exactly what its name would suggest. It’s a celebration of life itself and both humans and horses are fully enjoying the party! The celebration begins with ground-based acrobats, running tumbling, and playing for the audience. It’s clear from this scene that the performers are really enjoying themselves, laughing while jumping in and out of pyramid formations. Before long, the ground-acrobats are joined by athletes on jumping-stilts and horse and rider duos on stage, taking turns jumping increasing elevated hurdles. In addition to the raw energy he brings on-stage, Tutor has been known to be quite a character off-stage! He is extremely charismatic and very affectionate with everyone. His groomer Alexandra, among many others, can attest to the fact that he is quite the ladies’ man behind the scenes. Not only is Tutor playful with his human co-stars, he is very social and silly with the other horses as well. One of Tutor’s favourite things is to be noticed and showered with attention; his rider, Guillaume, often remarks that when he neighs, it’s almost as if he’s singing his own song. When he has some down-time at local farms during his 14-day tour break, Tutor loves to spend time with his best friend and fellow Lusitano, Melchor. Don’t miss Tutor and his best friend Melchor tearing it up together on-stage in Cavalia’s production Odysseo!